Everything is made from scratch with fresh ingredients. Not all items are available everyday but can be ordered in advance. We try to use our own fruit whenever possible for our pies, so some pies can only be offered seasonally. We also make varieties of quick breads, muffins, artisan breads, and sweet breads. Stop by for a piece of pie and enjoy eating it outside at one of the picnic tables by the barn or inside the barn. Oh so relaxing! Ask us to heat your pie and add some ice cream! Call 309-369-5080 to place an order. About ten years ago I decided my husband and I needed to add more to our farm (like farming a 1000 acres; I also worked part time as a nurse; and was raising a family). I decided to start a farm market. 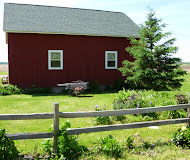 We had an old red barn that was built in 1921, withtimber from that farm, that was not being used. So I started with one very weedy patch of pumpkins. The next year I sold all the sweet corn we didn't use and had another weedy patch of pumpkins. I sold from a picnic table in front of the red barn. Their was a smaller building next to the barn that I talked my husband into helping me clean years of dirt and oil out, so I could also add a small gift shop. Our farm market is only a part of what we do as farmers. We have diversified our farm because we felt it better utilized the land. The growing of fresh fruits and vegetables, offering fresh from scratch baked goods, and field to table meals in our barn, is only 15 acres of our farm. We also have 83 acres of land that is in a wetland restoration program. It filters water before it reaches the Illinois River. We also raise 800 acres of corn, soybeans, alfalfa and wheat. As farmers and conservationalists, my husband (Dave) and I feel you have to look at the land and decide what is the best way to use it. The small gift shop has also grown. We have a small bakery now and we try to showcase Illinois food products. Stop by our Seasonal Farm Market for locally grown vegetables and fruits, rustic and one crust pies, stone baked artisan bread, cinnamon streusel bread, muffins, cookies and fruit toppings. Visit our Colleagues & our Facebook! 2012. All Rights Reserved. Jenkins Country Comforts & Farm Market. Watermark theme. Powered by Blogger.